Making good use of his advantageous starting position, Pablo Quintanilla has powered to a strong third place result on stage two of the 2018 Morocco Rally. 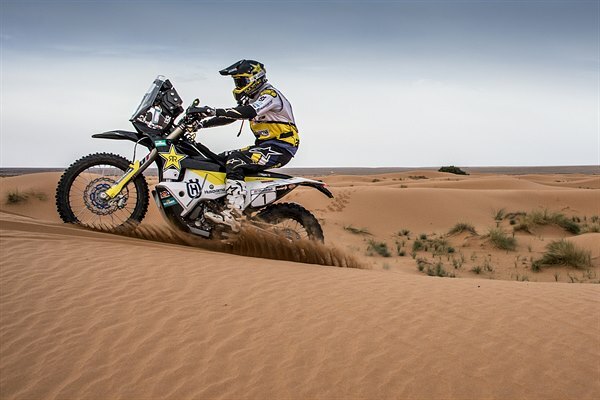 Putting in a solid performance today in the dunes of eastern Morocco, the Rockstar Energy Husqvarna Factory Racing rider is now looking to keep up his momentum as he heads into the final three stages of the rally. Returning stronger after a challenging opening stage, Quintanilla enjoyed a mistake-free stage two at the Morocco Rally. With Saturday’s timed special featuring tricky navigation, the Chilean rally star tackled everything that was thrown at him to climb back inside the top-10 in the rally’s provisional overall standings. Pablo is currently sixth overall. Enjoying a great first half of the timed special, Andrew Short lost time following a navigational mistake 40km before the finish. Posting the 10th fastest time for the day, the American will look for better individual stage results during the next three days of racing in Africa. Sunday’s stage three will once again start and finish at the Erfoud bivouac. The total distance to be covered is 280km with 275km of special stage. You may find high-res images from the Morocco Rally here.